A string field is limited to 80 characters but has a few records where 96 characters are stored. A numeric field is limited to zero digits after the decimal point but Apex code inserted records where digits appear. This tool will report the table, record id, column name, and problem description for any field that does not match the Salesforce field definition. The side of the dialog is used to select the tables to scan. 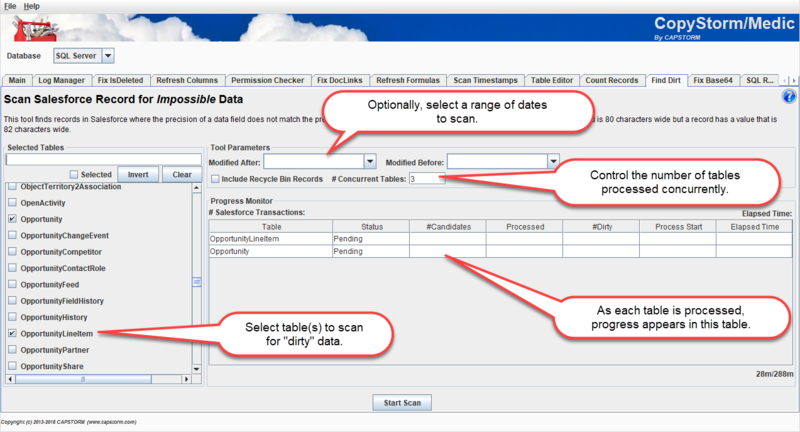 The top part of the dialog has parameters that determine the date range of records to be scanned. Leave these blank to scan all records. If an error is detected a “Show Problems” button will appear in the lower right hand corner. Click the button to see error details and/or export the errors to a file. If the “Show Problems” button appears, click it to show the details for each problem record.